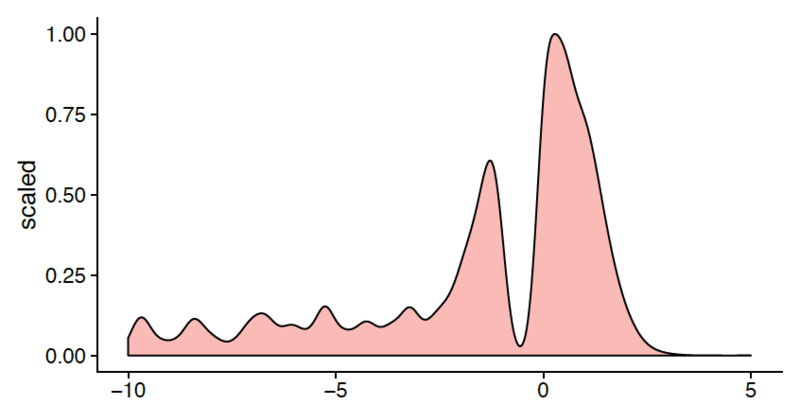 I was looking at the hard filtering cutoffs and hence looking at the distributions of MQ, QD, MRankSum and so on. All look fine - similar to yours (https://software.broadinstitute.org/gatk/documentation/article.php?id=6925) but one. I was wondering wether my ReadPosRankSumTest (ReadPosRankSum) distribution looks indeed funny or if there is a specific reason for that. Have a look at this article which explains a bit more about RankSumTests. It is interesting that you have two peaks and a major dip (where exactly is that dip located?). However, notice without that dip the majority of variants have values between -4 and 4 (like what we show in the article). I am not sure if this is anything to really worry about. The only thing to note is that a lot of variants have a negative value, indicating a lot of evidence for the alternate reads is found at the ends of reads compared to the reference allele. This could just be a "quirk" of your data. What kind of data are you working with? Thank you for you answer. It's standard Illumina data. HiSeq 2000. What kind of "quirk" could it be? Any suggestions as to the cause? So you think I could just ignore it? I figured I use a more stringent cutoff e.g, -2.5. I don't want to say you can ignore it for sure. Have you done any QC on your data? For example, have you checked the coverage, contamination, chimerism, and sequencing artifact metrics? Is this human data? Have you done some concordance tests against truth sets?